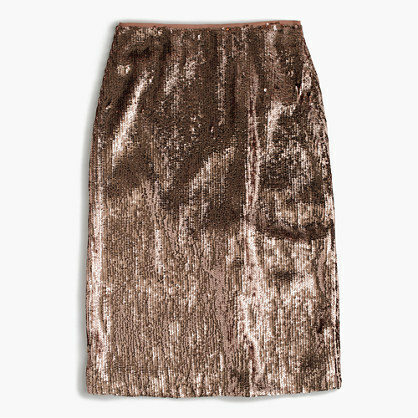 A classic and casual combination of a gold wool turtleneck and a J.Crew Tall Rose Gold Sequin Skirt can be relevant in many settings. A nice pair of gold leather ankle boots pulls this look together. 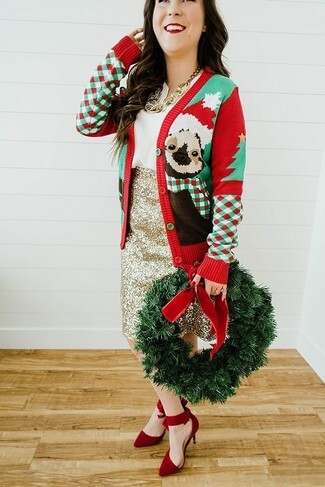 Teaming a red christmas cardigan with a J.Crew gold sequin pencil skirt is a great choice for a seriously stylish and sophisticated ensemble. We're totally digging how complete this outfit looks when completed by red suede pumps. For a casually chic outfit, consider wearing a beige cape coat and a gold sequin pencil skirt — these two items go pretty good together. White cutout leather pumps pull the look together. 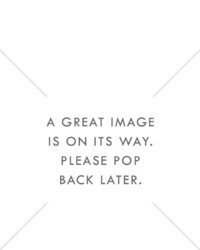 If the occasion calls for a refined yet neat look, wear a beige turtleneck with a J.Crew gold sequin pencil skirt. Gold embellished leather heeled sandals are a savvy pick to complete this look. 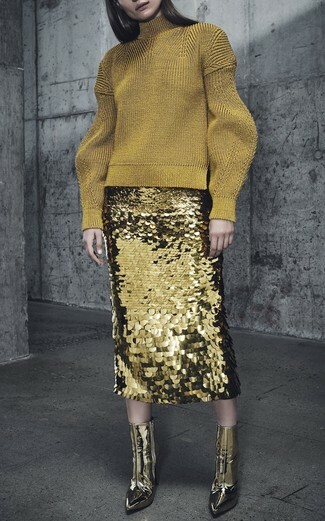 Why not marry a gold sequin cropped top with a gold sequin pencil skirt? These items are totally comfy and look amazing when paired together. A pair of silver leather pumps immediately dials up the wow factor of your look.